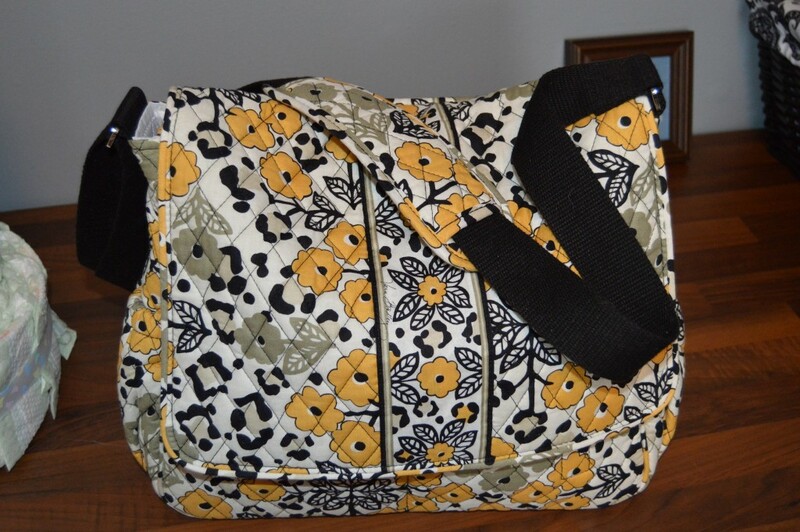 It took me months and months and months to finally commit on a diaper bag – I’m not sure this one is 100% “the one” either…but it will be for now! Not to mention, Vera Bradley for 75% off and basically everything I was looking for, I had to pull the trigger. It’s SO lightweight, has outside pockets and an plastic inside lining. I’m not thrilled with the pattern, but I’d say it’s a win win. I bought a second one, a bigger one which I plan to use for longer trips – here. I (think) plan to travel light with the diaper bag and keep things in the trunk for backup. I’m new at this so if anyone has tips, tricks or other suggestions I would love to hear them! The bag came with a changing pad in the backside compartment. I have a few diapers and a Huggies Wipe Clutch. 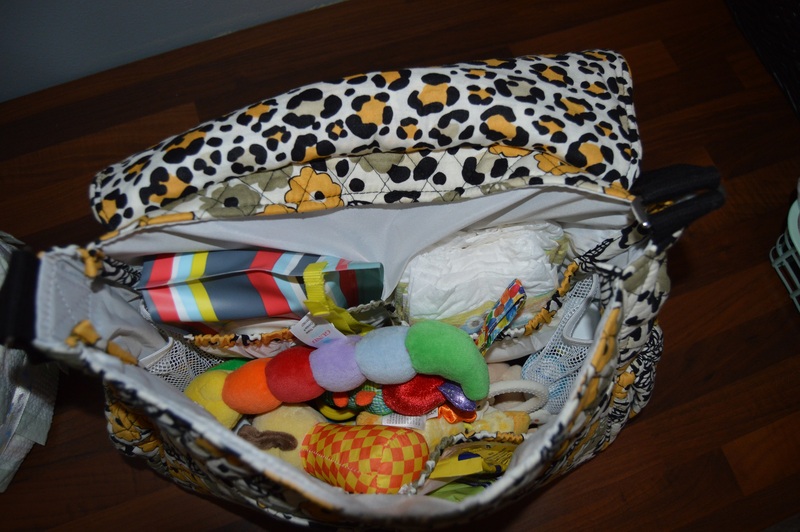 In the inner side pocket a small powder, diaper rash tubes and a pacifier. Similac and Enfamil have been sending me tons and tons of samples..so I stuck some single-use formula packets in there as well. Clearly, the bag is overrun with toys at the moment. 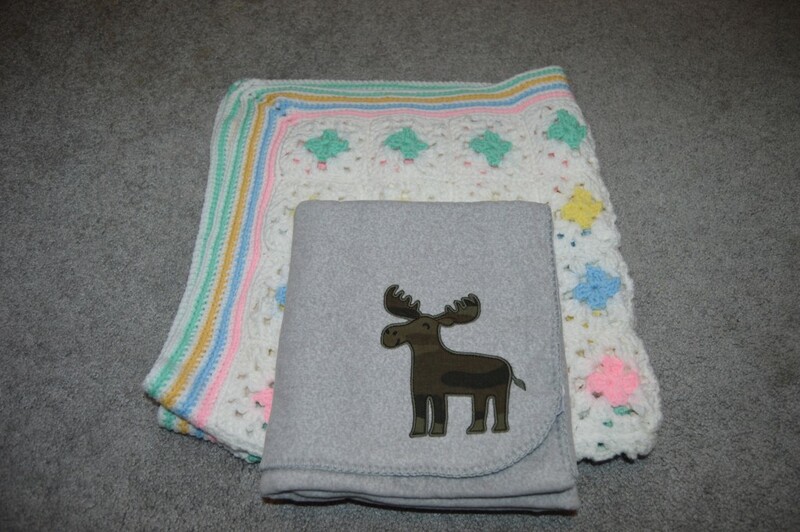 *Other things to add – burp cloth, blanket, change of clothes, bib, socks….anything else at the moment? Now, onto the hospital bag. There’s barely anything in our suitcase, yet it’s SO full. What’s going on! I have changed some of the items as it seemed like too much to pack for 2-3 days. As much as I love that little camo moose, I decided to leave him home and only pack my Grandma’s blanket to keep over the carseat on the way home. I also thought there were far too many onesies and sleep sacks so I had to edit this as well. 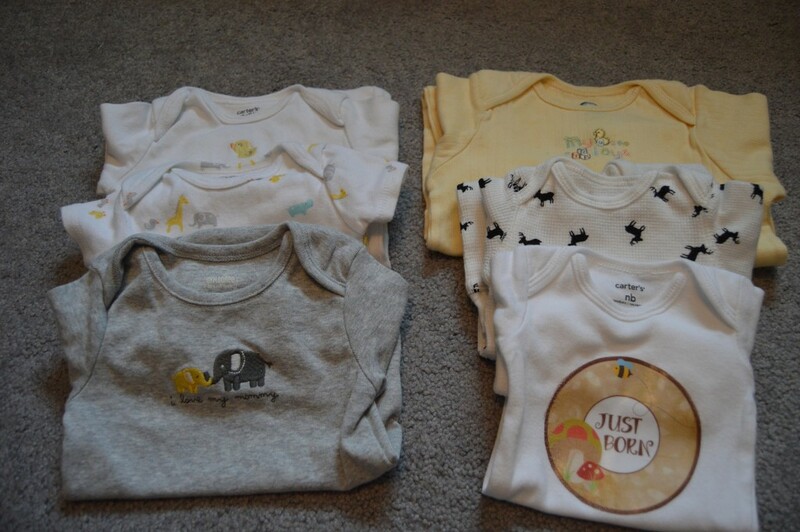 I’m taking the “Just Born” onesie which was a gift from my girlfriend and the onesie with animals all over. I figure two would suffice. I decided to keep all of the above little one piece, feet in outfits. 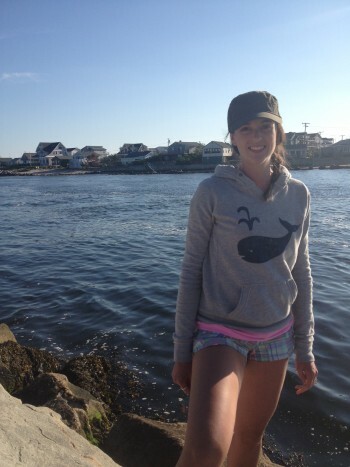 With the addition of one more hat. 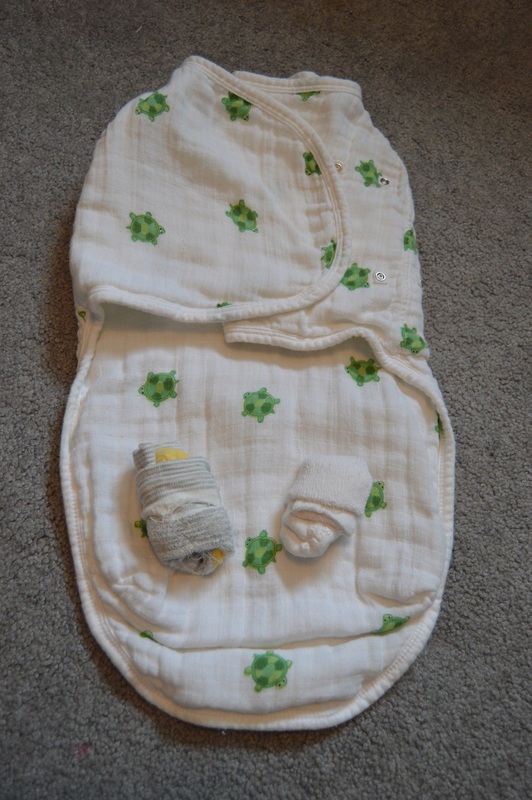 I packed one Aden + Anais Swaddle and two little socks. Aside from the baby items, I packed two cami’s, a couple bras (one nursing bra), socks, big underwear (which are from my hip surgeries), VS Sleep Shirt, a pair of loose fitting sweatpants, comfy lounge shorts and a sweatshirt. I packed super light and very comfy. Kevin has some comfy shorts, pj pants, a bathing suit (for helping me labor in the shower or tub), and a couple shirts, etc. I threw in a bag of snacks, hospital paperwork in case my online registration didn’t go through and an extra tote bag for coming home. We have to still pack the camera, Bose speaker, headphones, car seat (bases are installed already), money for the vending and bathroom items. We didn’t pack a lot but it still seems like too much! The nursery is officially ready – no more showers, no more gifts! We cleaned this place and put things where we want them – like the pack and play and bouncer. The more we do now, the less we have to do later. I put together a basket of items to keep downstairs so we don’t have to run upstairs to change the baby, or grab a toy/blanket or anything else. I’ve said it before…but NOW baby can officially come!!! And remember, you have until February 28 (Saturday) to join our baby pool and win some money! The link is at the top of the page and on the right. Good luck! This entry was posted in Uncategorized on February 25, 2015 by Danielle Laroche. I keep two thick blankets in the car and a small bag with wipes diapers underwear and extra set of clothes for each boy And a couple books and toys for them!!! I was carrying everything around with me and always found I was either forgetting something or they would spill something or get dirty and I would never have enough of anything. I carry a huge Victoria secreat bag with some diapers wipes snacks for the kids and myself. The bag has gotten a lot lighter since I keep that spare bag in the back if the car with little bags for poppie diapers and a box of tissues!